Phizzwhizzing new cover look and branding for the World's NUMBER ONE Storyteller! WHOOSH! Inside the Great Glass Elevator, Willy Wonka, Charlie Bucket and his family are cruising a thousand feet above the chocolate factory. They can see the whole world below them, but they're not... read full description below. Phizzwhizzing new cover look and branding for the World's NUMBER ONE Storyteller! WHOOSH! Inside the Great Glass Elevator, Willy Wonka, Charlie Bucket and his family are cruising a thousand feet above the chocolate factory. They can see the whole world below them, but they're not alone. The American Space Hotel has just launched. Lurking inside are the Vernicious Knids - the most brutal, vindictive murderous beasts in the universe. So grab your gizzard! Hold your hats! Only Charlie and Willy Wonka can stop the Knids from destroying everything! 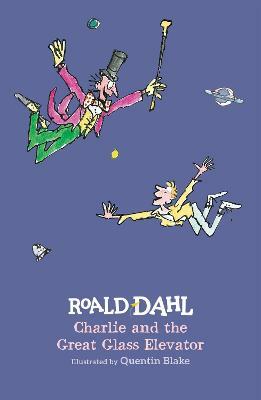 Listen to CHARLIE AND THE GREAT GLASS ELEVATOR and other Roald Dahl audiobooks read by some very famous voices, including Kate Winslet, David Walliams and Steven Fry - plus there are added squelchy soundeffects from Pinewood Studios! Look out for new Roald Dahl apps in the App store and Google Play- including the disgusting TWIT OR MISS! and HOUSE OF TWITS inspired by the revolting Twits. Sitting in a hut at the bottom of his garden, surrounded by odd bits and pieces such as a suitcase (used as a footrest), his own hipbone (which he'd had replaced) and a heavy ball of metal foil (made from years' worth of chocolate wrappers), Roald Dahl (Author) wrote some of the world's best-loved stories including Charlie and the Chocolate Factory, The Twits, The Witches, The BFG, Fantastic Mr Fox, James and the Giant Peach and lots more. Quentin Blake (Illustrator) is one of Britain's most successful illustrators. He has illustrated nearly three hundred books and he was Roald Dahl's favourite illustrator. He has won many awards including the Whitbread Award and the Kate Greenaway Medal and taught for over twenty years at the Royal College of Art. In 1999 he became the first ever Children's Laureate and in 2013 he was knighted in the New Year's Honours.